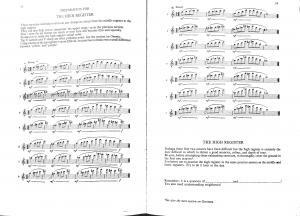 I hope you have Trevor Wye's "Practice Book for the Flute Volume 1". This book is a must-have. Click to see the image. 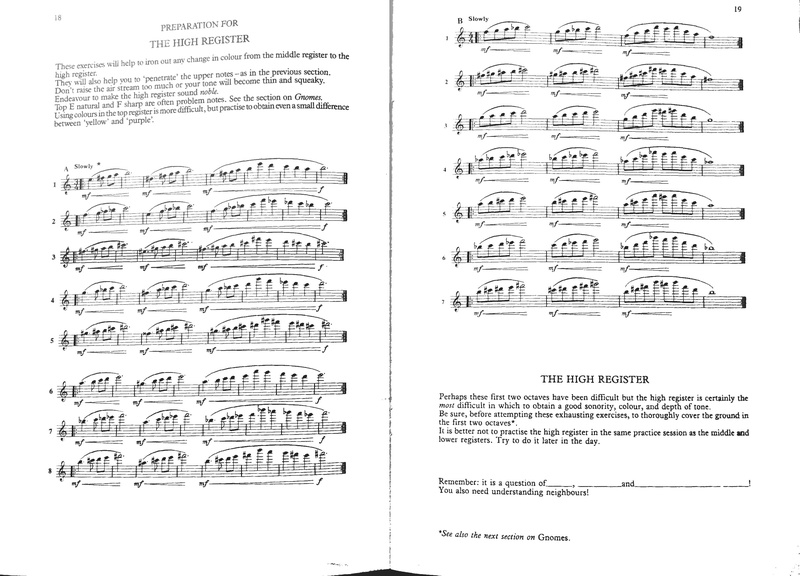 The section is called "Preparing for the high register". These 2 pages, page 18 and 19 are my favorite. This is one of the rare occasion you DO NOT USE METRONOME. Take your time to play each phrase. Have dense air, by compressing it with your diaphragm and embouchure, on the first note of the each phrase (1st beat of the measure 1, 3 and 5). Play each phrase only with the focus on the first note. In other words, you are still playing the first note while your fingers are moving to play the entire phrase. Do not increase the amount of the air but rather pull back the amount of the air as you move up, and make the air speed slightly faster with your embouchure to support higher register. Keep the entire phrase under mf because it will sound crescendo naturally when notes moves up the register. Do not think of making the crescendo. Imagine it’s a one of the movie scene, a cold but quiet winter, and you are waiting for someone to come back to you (or make up your own story). Must record yourself to check!